How to make a wave - in our sea of information. 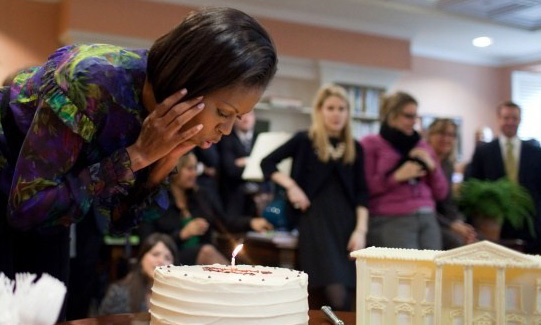 While Michelle Obama was celebrating her 50th birthday this weekend, she was unceremoniously kicked out of a club. I got the email in a plane on the runway. HE - the man responsible for my most embarrassing moment - is "eager to talk." This story is the beginning of a personal mission. But I need your help. We need each other's help. As I count down to age 50, my gut, which tells me the 18-49 premise is absurd, is reinforced by my mother-in-law's secret arm signal. I bumped into a trial lawyer acquaintance of mine. Somehow we got into talking about what litigators look for when choosing a jury. I just learned some things that have me really excited about turning 50. I learned these things from one of the leading jury consultants. I must remind myself, despite my "vast" life experience, always be prepared to be surprised. I was ready for my closing argument. The information I gathered added so much additional weight to my premise. My savvy and life experience could not prevent my jaw from dropping. It was another case of "I didn't know what I didn't know." I've finally spoken with the man whose hoax put me in the most embarrassing position of my journalistic career. Or have I?